Every business owners are looking for ways to save money. Many save by doing their own building cleaning or having staff perform the cleaning tasks themselves. What they don’t realize that time could be used to create more revenue for the business. There are many benefits of hiring Nationwide Cleaning companies. They not only leave the commercial building clean, safe, and hygienic, but also a contract cleaning company can also improve employee productivity and morale. Nationwide Commercial Cleaning can develop a cleaning maintenance check list specifically for you regardless of the size of your facility. Considering that every commercial building has individual cleaning needs, we work around scheduling to accommodate those needs. We offer a daily, weekly or monthly cleaning, as Nationwide cleaning service places a strong emphasis on personalization. There are many benefits of hiring Nationwide Cleaning company. They not only leave the commercial building clean, safe, and hygienic, but a contract cleaning company can also improve employee productivity and morale. Better Productivity: One major advantage to hiring Nationwide cleaning company is that your staff will not have to worry about cleaning. Employees can better focus on their job they were hired to do . An organized and presentable commercial building is also key to productivity. Range of Services: Maintenance companies in Melbourne provide a wide range of services to Commercial Companies. Rather having to hire separate companies, such as one for window cleaning and one for carpet cleaning, Nationwide cleaning company can provide you with a wide range of services that your business requires. Company can simply sit back and enjoy the peace of mind that a contract cleaning company provides. Healthy Enviornment: Nationwide Cleaning companies are not only accountable for keeping a work environment clean and tidy but also ensuring that it is hygienically clean. It’s very important as staff members will spend long hours inside the building and easy to spread germs from one employee to another. Nationwide contract cleaning company will ensure that germs are cleaned from all areas including phones, keyboards, and commonly used areas such as kitchens and bathrooms. Cost Benefits: Company owners will find that they actually save money in hiring contract cleaning company. When you hire a Nationwide contract cleaning company, we will bring our own cleaning supplies and bring our own cleaning equipment. Commercial Companies will not have the responsibility of purchasing items, such as vacuums and floor polishers. Nationwide contract cleaning has the skills and expertise to follow appropriate building cleaning techniques , hygiene practices and safety within a commercial building. 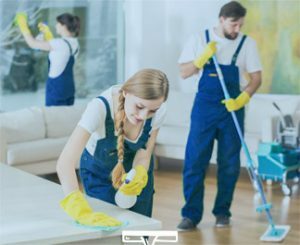 Advantages to hiring a cleaning service is that your building stays well, organized, clean, and hygienic for staff and customers alike. Start everyday by stepping into a sparkling clean building. Contact Nationwide for your Contract Cleaning services.